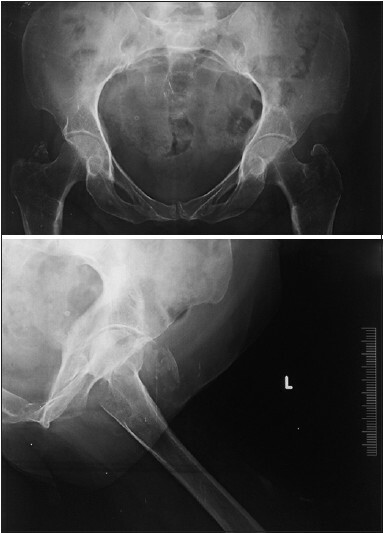 A 48-year-old woman sustained simultaneous isolated bilateral greater trochanteric fracture, following a road traffic accident. The patient presented to us 1 month after the injury. She presented with complaints of pain in the left hip and inability to walk. Roentgenograms revealed displaced comminuted bilateral greater trochanter fractures. The fracture of the left greater trochanter was reduced and fixed internally using the tension band wiring technique. The greater trochanter fracture on the right side was asymptomatic and was managed conservatively. The patient regained full range of motion and use of her hips after a postoperative follow-up of 6 months. Isolated fractures of the greater trochanter are unusual injuries. Because of their relative rarity and the unsettled controversy regarding their etiology and pathogenesis, several methods of treatment have been advocated. Furthermore, the reports of this particular type of injury are not plentiful and the average textbook coverage afforded to this entity is limited. In our study we discuss the mechanism of injury and the various treatment options available. Simultaneous bilateral greater trochanter fractures are extremely rare and truly unusual. There is controversy regarding their usual etiology and pathogenesis. Several methods of treatment are advocated in view of rather a high degree of associated subjective disability. Furthermore, the reports on this particular injury in worldwide orthopedic literature, especially in adults, are rare and the average textbook coverage of this entity is indeed limited. These fractures are seen as two distinctly different types, which occur in different age groups. The first are epiphyseal separations, which are found in adolescent population, usually from 7-17 years of age. In this type, the mechanism of injury is muscle contraction that results in avulsion of the entire trochanteric apophysis. The second type is a comminuted fracture of the greater trochanter, which is seen in adults, which results from direct trauma. A 48-year-old woman had a road traffic accident (patient was a pillion rider on a bike, which collided with a four wheeler) when she sustained injury to both her hips. The patient presented to our hospital after a month with complaints of pain in the left hip. She was unable to walk and was bed ridden since the injury. The patient could not recall the exact mechanism of injury. On physical examination, the patient had tenderness over both the greater trochanters (left > right) with no signs of acute inflammation. The patient had painful restriction of left hip movements, particularly adduction and internal rotation. The right hip was relatively nonpainful with only terminal restriction of movements. No other associated injuries were seen. Radiological evaluation revealed displaced comminuted left greater trochanteric fracture [Figure 1] and [Figure 2] and displaced comminuted right greater trochanter fracture [Figure 3]. Magnetic resonance imaging (MRI) study showed no intertrochanteric extension of the fractures. The patient and attendants were explained about the diagnosis and she was advised complete bed rest and was put on bilateral Bucks' traction. Routine preoperative blood investigations were performed, which revealed no significant medical illness. Open reduction and internal fixation was planned for the left greater trochanter (GT), which was symptomatic. The patient was taken up for surgery where, using a lateral approach, open reduction and internal fixation with tension band wiring (TBW) was performed for the left greater trochanter. 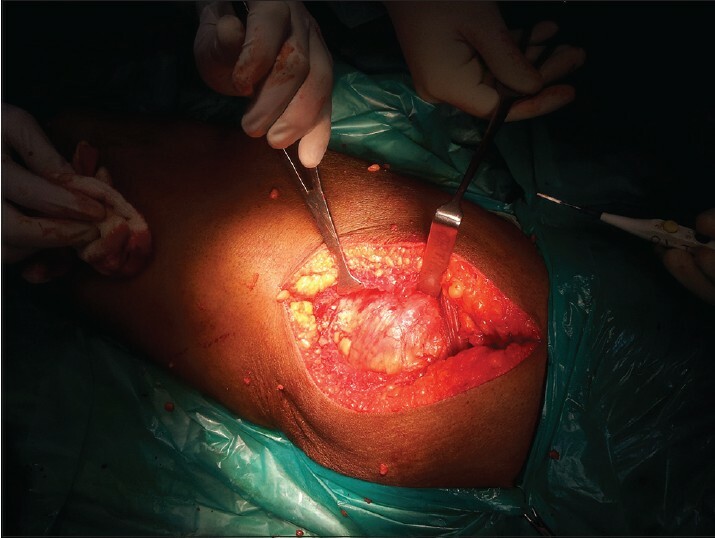 Intraoperatively, a large thick trochanteric bursa [Figure 4] and [Figure 5] was encounterd, which was excised and sent for biopsy. The greater trochanter fracture fragments were also sent for biopsy. Biopsy reports of the bursa revealed inflammatory changes and that of the bone revealed normal study. The right greater trochanter fracture was managed nonoperatively, because it was asymptomatic, using Buck's traction with the limb in abduction. 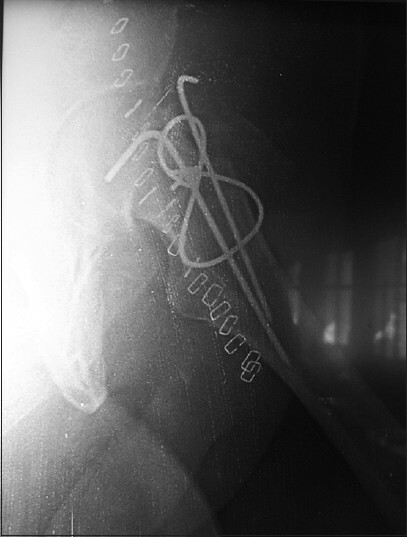 Postoperatively, X-rays were taken [Figure 6] and [Figure 7], which showed good reduction and stable fixation. Active mobilization of the left hip was started on the second day after surgery and Buck's traction was continued for the right lower limb. Partial weight bearing with the help of a walker was started after 6 weeks. The patient was advised to avoid sitting cross-legged and excessive adduction. Unassisted full weight-bearing was started after 3 months. The patient was followed up on regular intervals up to 6 months. 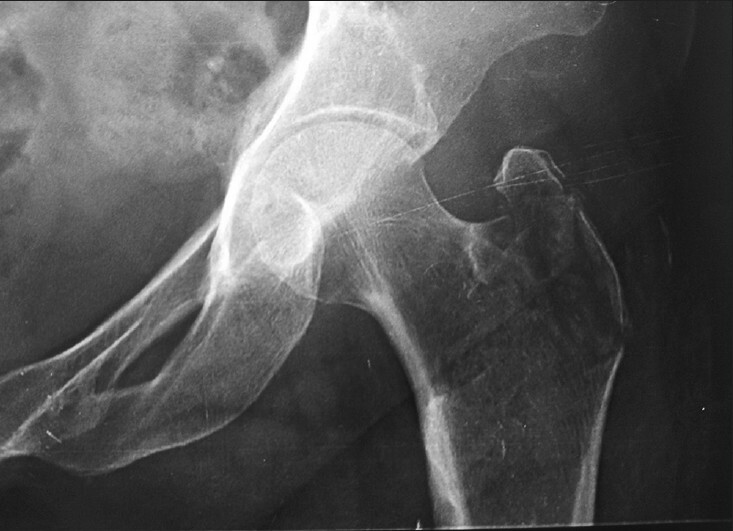 Isolated greater trochanter fractures are uncommon. They may be confused as sprains or contusions. The patient in our report was initially examined by a physician, but the diagnosis of greater trochanter fractures was not identified until a month later as proper roentgenograms were not obtained. Isolated fractures of the greater trochanter are classified either as true fractures, which occur solely in adults, or as epiphyseal separations, which are found in the adolescent population. It is reported that traumatic epiphyseal separations of the greater trochanter in adolescents are much more frequently encountered than true fractures in adults. It is generally accepted that these fractures are caused either by direct trauma over the trochanter, such as a blow, kick or fall, or by muscular violence, in which the bony fragment is avulsed from the trochanter. Angle of the fracture line. Both these parameters were measured on a plain anteroposterior radiograph. To measure the length of fracture they have drawn a straight line along the medial border of femoral shaft extending proximally into the pelvis. Then they measured the distance between the most superior point of the fracture line on the lateral cortex and the midpoint of lesser trochanter on the first line. Then they measured the length of the fracture starting from the most superior point on the lateral cortex and estimated the percentage of this fracture length in relation to the line. To estimate the angle, they have drawn a straight line along the medial border of femoral shaft extending proximally into the pelvis. Another line is drawn in the direction of fracture starting from most superior point of fracture on the lateral cortex joining the first line. The angle is measured between these two lines. Treatment of fractures of the greater trochanter has been controversial. In adults, in whom only a part of the trochanter is fractured, the remaining intact fibers of the gluteus medius usually prevent wide separation of the fracture fragment. Three types of treatment have been proposed in the literature. The third method of treatment consists of bed rest with or without traction until the acute symptoms subside (usually 10-14 days) followed by active exercises and crutch ambulation beginning with partial weight-bearing on the affected limb. Progression to full weight-bearing without crutches is gradual and usually complete in 4-6 weeks from the date of injury. Because of the very good prognosis with this particular fracture, most authors advocate the third method as the treatment of choice. In our study the left greater trochanter was treated with open reduction and internal fixation using tension band wiring (second method), whereas the fracture on the right side was treated conservatively (third method). Both results were satisfactory. The controversy regarding which mechanism is responsible for most of the isolated trochanteric fractures in adults is not settled in the literature. Avulsion fractures are due to excessive muscular forces, commonly seen in adolescents. These fractures are usually transverse, clear with sharp edges, displaced and non-comminuted. On the other hand, greater trochanter fractures in adults are usually comminuted due to direct trauma as seen in our study. These, like intertrochanteric fractures, are more common in postmenopausal females due to osteoporosis and can follow a direct trivial trauma. In our study, the patient sustained the fractures following a road traffic accident and the exact mechanism is not known. We hypothesize that she received direct trauma to both her hips sequentially during the road traffic accident, which resulted in the greater trochanter fractures. This trauma might not have been severe enough to cause an intertrochanteric fracture. 1. Ang W, Lee FT, Hsu WY. Simultaneous bilateral greater trochanter avulsion fracture-A case report. Journal of Orthopedic Surgery Taiwan 1995;12:149-51. 2. Merlino AF, Nixon JE. Isolated fractures of the greater trochanter. Report of twelve cases. Int Surg 1969;52:117-24. 3. Armstrong GE. XV. Isolated fractures of the greater trochanter. Ann Surg 1907;46:292-7. 4. Gaumetou E, Zilber S, Hernigou P. Non-simultaneous bilateral hip fracture: Epidemiologic study of 241 hip fractures. 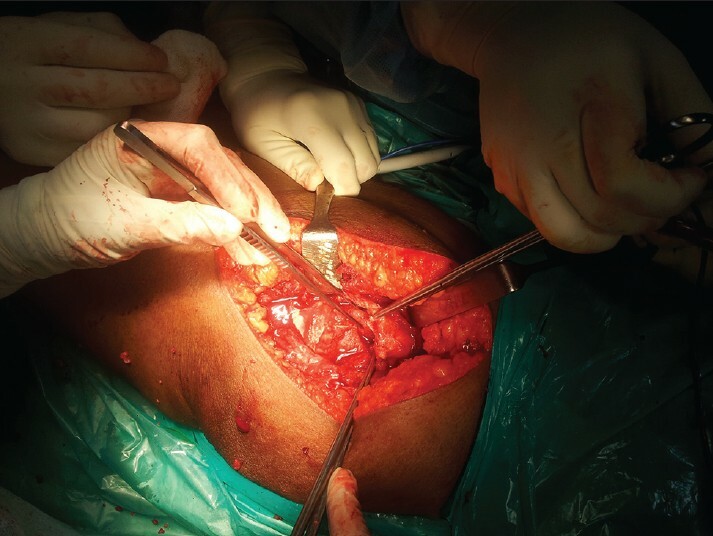 Orthop Traumatol Surg Res 2011;97:22-7. 5. Kim SJ, Park BM, Yang KH, Kim DY. Isolated fractures of the greater trochanter. Report of 6 cases. Yonsei Med J 1988;29:379-83. 6. Stevens MA, El-Khoury GY, Kathol MH, Brandser EA, Chow S. Imaging features of avulsion injuries. Radiographics 1999;19:655-72. 7. Feldman F, Staron RB. MRI of seemingly isolated greater trochanteric fractures. AJR Am J Roentgenol 2004;183:323-9. 8. Joshy S, Maripuri S, Mohanty K. Isolated greater trochanter fractures: Can we predict intertrochanteric extension? 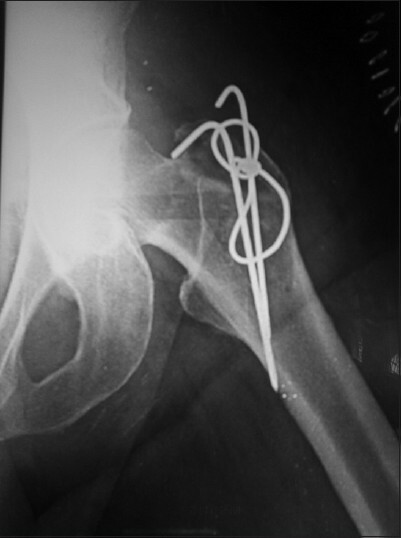 J Bone Joint Surg Br 2010;92-B Suppl 2:273. 9. Ratzan MC. 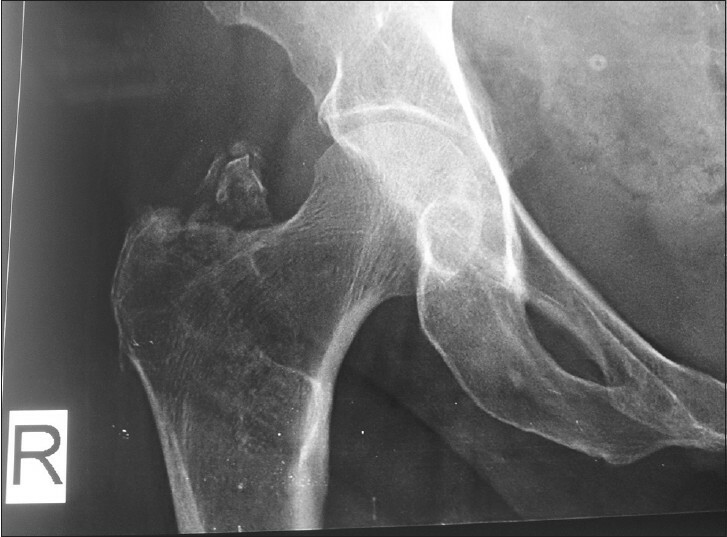 Isolated fracture of the greater trochanter of the femur. J Int Coll Surg 1958;29:359-63. 10. Watson-Jones R. Fractures and joint injuries. Vol. 2, 26 th ed. Edinburg: E and S, Livingstone; 1956. p. 653-4.